4 Things To Know About Cory Booker's Election : It's All Politics With his media savvy and national celebrity, the senator-elect from New Jersey is already a recognizable figure outside his home state. 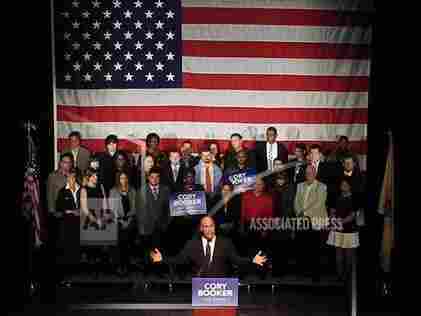 Cory Booker's victory Wednesday in New Jersey's special Senate election didn't surprise anyone. From the moment he captured the Democratic nomination in the reliably blue state, the Newark mayor was the heavy favorite to defeat Republican Steve Lonegan. With his media savvy and national celebrity, the senator-elect is already a recognizable figure outside his home state. When Booker is officially sworn in, he will become the ninth African-American in history to serve in the U.S. Senate, and just the fourth to have been popularly elected. The last African-American elected to the Senate? Barack Obama, out of Illinois in 2004. The other two were Massachusetts Republican Edward Brooke in 1966 and Illinois Democrat Carol Moseley Braun in 1992. The only current African-American senator is Tim Scott, the South Carolina Republican appointed by Gov. Nikki Haley last December after Jim DeMint resigned to head the Heritage Foundation. Counting Booker's victory, Democrats have now won 14 straight U.S. Senate races in New Jersey — the party's third-longest winning streak in the nation. The last Republican Senate victory in the Garden State came in 1972, when Sen. Clifford Case won his third term (other Republicans were appointed to the Senate during this period, but not elected). Hawaii and West Virginia are the only states with a longer GOP drought. A Republican Senate candidate hasn't won in Hawaii since 1970 or in West Virginia since 1956. Booker won fairly comfortably Wednesday night, earning about 55 percent of the vote to Lonegan's 44 percent. Still, the score was closer than many expected — and Booker even lagged behind President Obama's state performance in 2012 when he won 58 percent to Mitt Romney's 41 percent. Of course, it isn't a perfect comparison. Off-year or special Senate races garner far less attention than presidential contests, meaning dramatically lower turnout. And on top of that, the election occurred on a Wednesday rather than the traditional Tuesday. Booker supporters shouldn't even bother to take down their yard signs: He's back on the ballot again in about a year. While senators typically have a six-year respite between elections, Booker only gets a short breather — he won a special election to serve out the remainder of the late Sen. Frank Lautenberg's term, which ends in January 2015. That means Booker will be back on the campaign trail in no time and Democrats can expect more fundraising pleas from him in the coming weeks.